Indian desserts are uniquely delicious little bits. Unlike desserts in the USA, they’re a reasonable size portion for a person that just ate a heavy curry. But like all food in India, they don’t come up short on flavor. Puddings, fudge like squares and fried delicacies come together in New Delhi at Bengali Sweets, a famous, and very crowded bakery. 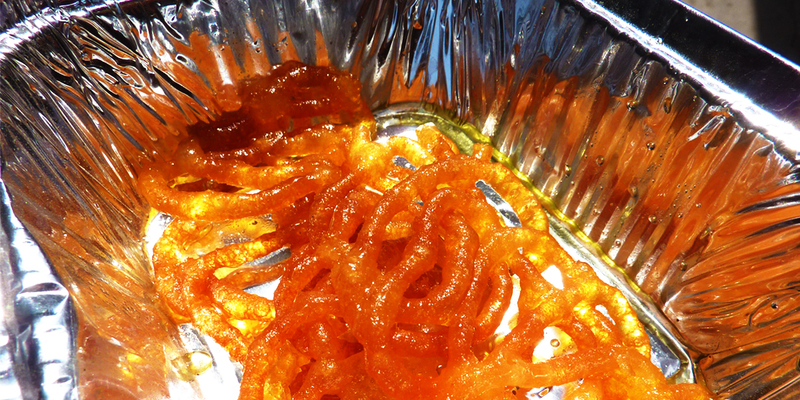 One treat stood out: the Jalebi. All cultures have their fried dough but this one takes it one step further. After the thin noodle of batter is deep fried (to order of course), it’s dipped in a lightly spiced sugar syrup. The result is a very lightly crunchy swirl of shiny dough. Each bite releases a bit of the complex syrup that has soaked into the bubbles in the dough. This entry was posted in Food, Places, Travel and tagged Delhi, India, Street.